Want to get to know some of these producers? Bio: Started in 2010, Buffalo Ridge is South Africa’s only manufacturer of real Mozzarella di Bufala. The farm is home to 30 Water Buffalo, imported from Campana in Italy, and their products contain absolutely no additives, colourants or flavourants. Bio: Richard is a local meat legend. Started in 2009, Richard Bosman's Quality Cured Meats sources their produce from local farms ethically rearing to produce some of Cape Town's best loved chacuterie and cured meats. Bio: Mark is a super awesome guy who has been producing epic local honey since 2010. Product Range: Smoked Olives, Blackberry Dressing Olives, Garlic & Chilli Olives, Olive Salt, Olive Oil. Olive Oil/Leaf Extract Body Products: Soap, Hand Wash, Shower Gel, Nail Treatment, Scalp Treatment, Lip Balm, Body Butter. Bio: You don't get more olive than the picturesque hills of Riebeek-Kasteel. In addition to offering some exciting new-age olive recipes (think smokey and blackberry flavours), Kloovenburg Olive Estate are pushing the industry even further by introducing a variety of innovative olive inspired products including a range of skin and body products. Product Range: Floral sources include Aloe, Raw Avocado, Orange Blossom, Saligna, Sunflower, Buffalo Thorn and Fynbos. Other products include raw honey comb, fermented and powdered bee pollen and raw bees wax. Where else can you find these products: Old Biscuit Mill (Woodstock), Oranjezicht City Farm Market (Granger Bay), Earth Fair Market (Tokai). Product Range: Handmade pickled Jalapeños. Origin of products: Sourced from the world’s top coffee producing regions. Product Range: Nicaragua Sejonia Estate, Ethiopian Limu, Trifecta Blend (medium roast), Lake House Blend (medium), Colombian Co2 Decaf. Bio: Based in the Northern Suburbs of Cape Town, Republic Coffee Co. was formed out of the instinctive desire for the finer things in life. Enjoying freshly roasted coffee, from an artisan roastery, is just one of those finer things! We love fresh coffee, and we know you do too. Origin of products: Produced in the Noordhoek Valley, using locally sourced ingredients. Product Range: Piccalilli, Sweet Chilli Relish, Bread and butter Cucumber Pickles, Pineapple Chilli Chutney. Bio: Its quite simple really. Preservative-free, tasty and fresh products made with love, care and more love. Where else can you find these products: Earth Fair Market (Tokai)​, Deli. "I don't think many people grow up wanting to be shopkeepers. I certainly didn't (too many keys!). It just kinda happened over time. The culmination of different experiences, jobs and encounters over time. I guess it all started with my father. Every year he would buy fresh olives from local farms and prepare them according to the same methods his family had used in Cyprus over many generations before him. One year he asked me to type out some of the recipes to share with friends and family who were also interested in curing their own batch of olives. While doing so, I happened across an article highlighting some of the many health benefits associated with olives and olive oil. Further research also revealed that South Africa was producing some amazing olive products (most notably olive oil), but that the industry was struggling to compete against much cheaper imports. The juxtaposition of a struggling industry with a world-class product called for more research, the summary of which I submitted to an online publication called the Olive Oil Times who invited me to be a guest correspondent and a couple more articles followed. These developments eventually lead me to a marketing job at a local olive estate. It was during this period that my obsession with olive oil began. While all this was going on my father, in typical Cypriot style, was selling his olives (among other things) in the family watch business. Novelty aside (I think the local hipsters couldn't resist buying some feta from the neighborhood watchmaker), it seemed that there was a demand for quality Mediterranean products in our area. 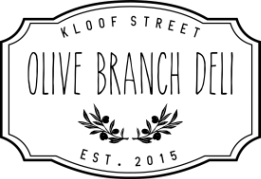 This constituted the necessary market research which would eventually form the inspiration behind the Olive Branch Deli when the right location came up in Kloof Street, Cape Town. In addition to stocking some of the country's finest olive oils, we have evolved our concept beyond a traditional deli to incorporate seasonal and artisan products from local vendors who traditionally trade at the weekend farmer's markets. As a "community grocer", we provide local vendors with a platform to sell and market their products on a daily basis and in return we are able to offer our customers fresh and unique products sourced locally and sustainably. The best part about dealing with these guys (some more eccentric than others) is that somewhere between farm and plate, a story much like the one above, but with many more twists and turns, had to take place in order for them to get to where they are today. These are the stories which line our shelves at the Olive Branch Deli in Cape Town." Close to 10 000 unique products. Rare and unique speciality ingredients sourced locally and internationally for product testing and menu tasting. Whether its a home chef looking for that tricky-to-find Otto Lenghi ingredient or chefs in need of molecular gastronomy. Sourced from their countries of origin, our over-sized spice-rack features over 150 unique spices and herbs from around the world. Non-irradiated and organic wherever possible, we encourage chefs and home-chefs to take advantage of our packaging-free/on-tap offering when trying out new recipes or for menu-development and product-development. We employ the same principles when choosing which titles to stock as we do with our food. Featuring both local and international chefs as well as special interests. Books cover topics from foraging to fermenting. One of the amazing bi-products of the various specialist fields above is that we are in essence establishing a comprehensive list of ingredients that any chefs, homecooks, holistic medicine practitioners and mixologists might be looking for. Every day we receive requests for weird and unusual products which someone has tried on a recent visit or read about in a cookbook or recipe book.